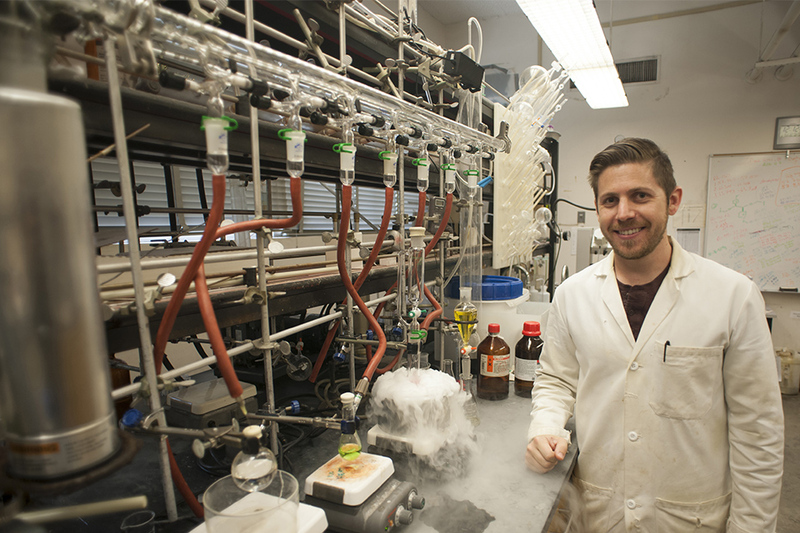 Ryan Davis, a CSUN alumnus, will begin a doctoral program in chemistry at Yale University as a recipient of a 2016 National Science Foundation Graduate Research Fellowship. Photo by Luis Garcia. This fall, Ryan Davis ’15 (Biology) will begin a doctoral program in chemistry at Yale University as a recipient of a 2016 National Science Foundation Graduate Research Fellowship, the oldest graduate fellowship of its kind and one of the most prestigious. Fellows benefit from a three-year annual stipend of $34,000, along with a $12,000 cost-of-education allowance for tuition and fees (paid to the institution), opportunities for international research and professional development, and the freedom to conduct their own research at any accredited U.S. institution of graduate education. The 32-year-old Davis said the fellowship was made possible because of the support and guidance of California State University, Northridge faculty and the research he has done. Davis transferred to CSUN in 2013 from Pierce College, but his journey was full of obstacles and curves along the way. Music always had been a significant part of Davis’ life, so when he graduated from high school, the self-taught guitarist thought music was his best option. He poured himself into music and ended up signing with a record label, touring the world and obtaining a “moderate” level of success in the music industry. But Davis was not happy and decided to enroll in a San Diego community college. He enrolled in an introductory chemistry class and fell in love with the subject. He initially thought he would go to medical school. Davis obtained his emergency medical technician license to support himself and get some experience. In 2011, his older sister was diagnosed with cancer, and he decided to move back to the San Fernando Valley. He enrolled at Pierce College and took a job working in the college’s chemistry stockroom. Davis visited CSUN to find out more about its programs, and an adviser recommended he contact Department of Chemistry professor Gagik Melikyan. The two met, Melikyan invited Davis to join his research group and today, the CSUN chemistry professor is the former musician’s No. 1 cheerleader. “Ryan is one of the best students I have ever had,” Melikyan said. “I’m absolutely positive he will be successful in any doctoral program in this country. “He is one of the CSUN students who will definitely make us proud,” Melikyan added. Davis has worked in Melikyan’s research group since 2013, where he has done research at the interface of organic, organometallic, computational and medicinal chemistry. He has co-authored several papers due to be published with Melikyan and presented at numerous conferences. He also has won several other awards, including the 2015 ACS Southern California Undergraduate Research Conference (SCURC) Outstanding Oral Presentation Award, 2015 Sigma Xi CSUN Student Research Symposium Second Place Award and the 2015 Leslie and Terry Cutler Scholarship for Outstanding Promise in Science.